Some origins in eukaryotic chromosomes fire more frequently than others. In the fission yeast, Schizosaccharomyces pombe, the relative firing frequencies of the three origins clustered 4-8 kbp upstream of the ura4 gene are controlled by a replication enhancer - an element that stimulates nearby origins in a relatively position-and orientation-independent fashion. The important sequence motifs within this enhancer were not previously localized. Systematic deletion of consecutive segments of ~50, ~100 or ~150 bp within the enhancer and its adjacent core origin (ars3002) revealed that several of the ~50-bp stretches within the enhancer contribute to its function in partially redundant fashion. Other stretches within the enhancer are inhibitory. Some of the stretches within the enhancer proved to be redundant with sequences within core ars3002. Consequently the collection of sequences important for core origin function was found to depend on whether the core origin is assayed in the presence or absence of the enhancer. Some of the important sequences in the core origin and enhancer co-localize with short runs of adenines or thymines, which may serve as binding sites for the fission yeast Origin Recognition Complex (ORC). Others co-localize with matches to consensus sequences commonly found in fission yeast replication origins. The enhancer within the ura4 origin cluster in fission yeast contains multiple sequence motifs. Many of these stimulate origin function in partially redundant fashion. Some of them resemble motifs also found in core origins. The next step is to identify the proteins that bind to these stimulatory sequences. Within the long DNA molecules of eukaryotic chromosomes, some replication origins fire more frequently than others. In most cases, it is not clear why certain origins are preferred. In several species, however-fruit flies (Drosophila melanogaster) [1, 2], budding yeast (Saccharomyces cerevisiae) [3,4,5,6], and fission yeast (Schizosaccharomyces pombe) -evidence suggests that sequences called "replication enhancers" stimulate nearby origins. This stimulation is independent of enhancer orientation and, within a limited range, independent of distance to the origin. Replication enhancers in fruit flies control the programmed amplification (extra rounds of replication in non-cycling cells) of chorion gene clusters on the third and X chromosomes. On the third chromosome, several cis-acting sequences, ACE3 and AER-a through AER-d, are essential for amplification [1, 2]. Of these, ACE3 is quantitatively the most important. Its ability to stimulate amplification is both orientation- and (within 1.5 kbp) distance-independent. It has been localized to a 320-bp region, and the effects of internal deletions suggest that it contains multiple partially redundant internal domains . Whether it can stimulate non-chorion replication origins has not, to our knowledge, been tested. In budding yeast, replication enhancers have been found near several different chromosomal replication origins. In several cases, the enhancers bind transcription factors [3,4,5]. In all cases tested so far, budding yeast enhancers have proved to be origin-specific; they stimulate only the origin with which they are normally associated in the chromosome [5, 6]. The replication enhancer that has been studied in fission yeast is part of the ura4 origin cluster - a group of three origins, called ars3003, ars3002 and ars3004 in their order from left to right upstream of the ura4 gene in the left portion of chromosome III (green boxes in Fig. 1; [7,8,9]). We recently found that ars3002 and ars3004 overlap by ~400 bp (between the Eco RI and Hin cII sites, Fig. 1; ). The overlap region is essential for ars3004 to function as a replication origin in plasmids. In contrast, the ~800-bp Eco RV-Eco RI fragment containing core ars3002 (without the overlap) is sufficient for plasmid origin function. However, addition of the overlap region to core ars3002 dramatically increases its plasmid origin activity . Moreover, although the overlap region has no plasmid origin activity of its own, it strongly stimulated the plasmid origin activity of all other tested origins (ars3001 and ars3003), and it did so in a relatively distance- and orientation-independent fashion . For these reasons, we call the overlap region a "replication enhancer" (yellow RE in Fig. 1). We consider the enhancer to be a functional part of both ars3002 and ars3004. We found that the enhancer could not be substituted by a DNA fragment of the same size and base composition but different nucleotide sequence . This observation suggests that specific nucleotide sequences within the enhancer are required for its function. The ura4 gene and its nearby cluster of replication origins. The diagram is based on the nucleotide sequence of S. pombe cosmid c330 (EMBL accession number SPCC330). The numerical scale indicates nucleotide sequence position within SPCC330. Cut sites for selected restriction enzyme are shown in blue. The locations of the two characterized (ura4 and pmp20) and uncharacterized (SPCC330.07c and SPCC330.08) open reading frames and their putative directions of transcription are shown by the magenta arrows. Replication origins are indicated by green boxes. Lighter green boxes are more efficient chromosomal replication origins than darker green boxes [7,8,9]. The replication enhancer (RE) is shown in yellow. Previously we characterized sequence elements within core ars3002 that are important for its activity as a plasmid replication origin . Now we have asked whether the sequence elements previously identified as important are also important when core ars3002 is combined with the replication enhancer to form extended ars3002. We have also determined which sequences within the enhancer are most important for its ability to stimulate ars3002. To determine which nucleotide sequences are most important for core origin and enhancer function, we constructed consecutive ~50-bp deletions throughout extended ars3002. To simplify production of these deletion mutants, we destroyed the Eco RI site between the core ars3002 and the enhancer and introduced a Cla I linker (see Materials and Methods). This manipulation did not cause any detectable change in plasmid origin activity (data not shown). All deletions were constructed in this altered plasmid. They are called Δ1-Δ22. Their locations are shown in Figure 2, which also shows the positions of the inactivated Eco RI site (light orange highlight) and of the introduced Cla I linker (yellow highlight). Note that Δ1-Δ15 are located in core ars3002 and correspond in position precisely to the ~50-bp deletions previously studied in this region . Nucleotide sequence of the modified extended ars3002 showing the boundaries of the ~50-bp deletions. The nucleotide sequence with gray background is the modified extended version of ars3002, cloned into the vector pUra4script (see Materials and Methods). The flanking nucleotide sequences with white background show portions of the vector sequence. 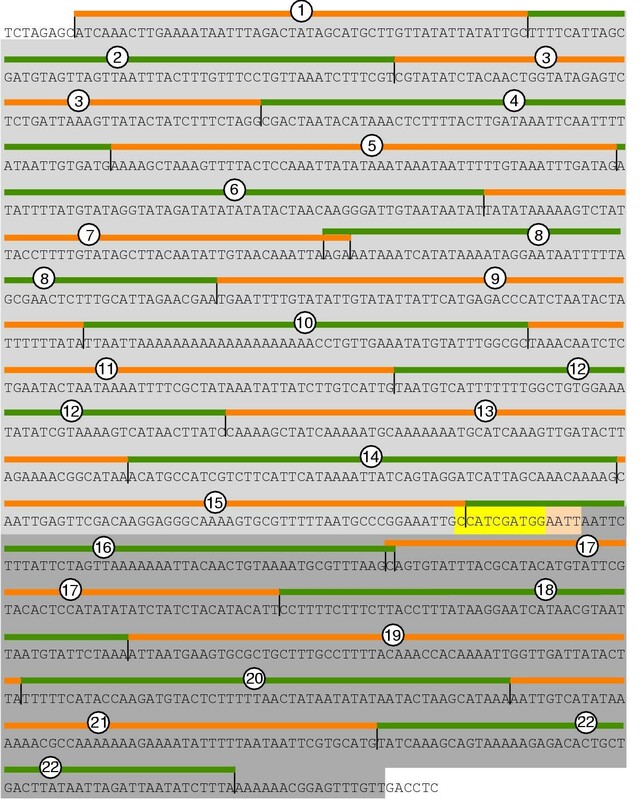 Yellow highlighting indicates the inserted Cla I linker, and light orange highlighting indicates the modified Eco RI site. The sequence with light gray background corresponds to core ars3002 (nucleotides 19,312 to 20,125 of SPCC330; see legend to Fig. 1), while the sequence with dark gray background corresponds to the replication enhancer (nucleotides 20,126 through 20,523 of SPCC330). Each numbered orange or green line indicates the boundaries of the corresponding ~50-bp deletion. Figure 3a shows the average values of four independent transformation experiments with constructs containing (from left to right): intact extended ars3002 (Ext), ~50-bp deletions Δ1-Δ22, core ars3002 (lacking the replication enhancer), and vector alone. All results were calculated relative to the values generated by extended ars3002. Blue bars indicate relative transformation frequency (number of colonies generated per 100 ng input DNA), and gold bars indicate the relative average areas of the transformed colonies, which is a reflection of colony growth rate. In general, the more efficiently a plasmid replicates, the greater the number of transformed colonies and the faster those colonies grow under conditions that select for plasmid maintenance [7, 10,11,12]. Notice that the replication efficiencies of all the deletions, except Δ10, are greater than those of intact core ars3002 (core, Fig. 3a), which was the subject of our previous study . Effects of deleting stretches of ~50-bp from (a) extended ars3002 or (b) core ars3002. In (a), transformation frequencies (blue bars) and mean colony sizes (gold bars) are shown relative to those of modified extended ars3002 (sequence in Fig. 2). Each bar represents the mean of four independent experiments, and the error bars show standard deviations. Controls include intact, extended ars3002 (Ext), intact core ars3002 (Core), and vector alone (Vector; pUra4script ). Panel (b) shows our previously published  transformation frequency results for deletions Δ1-Δ14 in core ars3002, in the absence of the enhancer. Here the values are relative to intact core ars3002, which is a much less efficient origin than extended ars3002 (see panel (a)). In panel (b), the results are the averages of two experiments, and the error bars show the data range. For comparison purposes, the results from our previous study of core ars3002 are displayed in Fig. 3b. In the previous study, we measured replication efficiency only by the transformation frequency assay (blue bars). The results were expressed relative to those obtained for intact core ars3002. Note that our new results (Fig. 3a) show that the transformation frequency of intact core ars3002 is only about 40% that of extended ars3002. Thus the heights of the blue bars in Fig. 3b are exaggerated compared to those in Fig. 3a. The previous transformation frequency results (Fig. 3b) revealed that the Δ4-Δ14 regions are important for the transformation activity of core ars3002, and the Δ8 and Δ10 regions are essential. Our new transformation frequency results (blue bars in Fig. 3a) show that in the context of extended ars3002 with its replication enhancer, none of the ~50-bp deletion regions within the core is individually essential for transformation activity, and only the Δ10 region is important. As discussed in detail below, we have found that when plasmid origin efficiency is generally high, colony size measurements are more sensitive indicators of small differences in origin activity than are transformation frequency measurements. For that reason we interpret the colony size reductions produced by deletions Δ11-Δ14 (Fig. 3a) to indicate that these deletions cause a small decrease in plasmid origin activity, even though these deletions have no effect on transformation efficiency. Thus the transformation frequency and colony size results show that sequences within the enhancer partially or completely suppress the negative effects of deletions Δ4-Δ14 on the plasmid origin activity of core ars3002. The simplest explanation of this observation is that sequences within the enhancer-in combination with other core sequences-are partially or fully competent to carry out each of the replication functions mediated by each of the ~50-bp regions within the core. Note that the enhancer must work in combination with the core, because the enhancer by itself has no plasmid origin activity . It is interesting that deletion Δ15, which is part of the core but was not previously tested due to a cloning problem , has a slight stimulatory effect on colony size, implying that region 15 may be a mild suppressor of plasmid origin activity. The stimulatory effect of deleting region 15 is more obvious in the double and triple deletion analyses to be presented below (Fig. 5). Correlation between plasmid retention rate and colony size. Groups A, B and C consist of deletion mutants producing large, medium and small colonies, respectively. See the text for details. Images of colonies on Petri plates were photographed at the same magnification 5 days after transformation. Plasmid retention rates are shown with standard deviations and number of transformants tested (in parentheses). Effects of deleting stretches of (a) ~100 bp and (b) ~150 bp from extended ars3002. See the legend to Fig. 3a for details. The results in Fig. 3a also indicate that there is considerable sequence redundancy within the enhancer itself. None of the ~50-bp deletions within the enhancer (Δ16-Δ22) reduces transformation frequency. Therefore none of these regions is uniquely essential for enhancer activity. However, some of the deletions (Δ16-Δ20) moderately reduce colony size, indicating that each of the corresponding regions (16-20) makes a modest unique contribution to enhancer activity. In Fig. 3a we used both transformation frequency and colony size to evaluate plasmid origin activity. Transformation frequency is the standard assay for plasmid origin activity in S. pombe [9, 12, 13]. Colony size measurement is usually more reproducible than transformation frequency measurement (compare the error bar sizes in Fig. 3a), but colony size measurement is a newer assay and not yet so widely used [7, 11, 12]. Furthermore, the results obtained with the two assays are not identical. Two of the mutants studied in Fig. 3a (Δ19 and Δ20) produce elevated transformation frequencies combined with slightly reduced colony sizes. Other mutants (Δ11-Δ14, Δ16) yield normal transformation frequencies and significantly reduced colony sizes. Only in the cases of Δ10 and core ars3002 are transformation frequency and colony size simultaneously reduced. For these reasons, it seemed important to check the validity of colony size measurement by comparing it to an alternative well-established indicator of plasmid origin activity-plasmid retention rate under selective conditions (reviewed in ). Plasmid retention rate is the proportion of cells containing plasmid during exponential growth in selective medium. To simplify our measurements, we divided the mutants into three groups based on the relative colony size data in Fig. 3a. The mutants in group C (Δ10, Δ13 and Δ14) generated the smallest colonies (20-38 % of the area of those generated by the control, which was intact extended ars3002). The mutants in group B (Δ7, Δ11, Δ12, Δ16-Δ20) produced larger colonies (50-79 % of control). The rest of the mutants were in group A (colony size >80 % of control). Then we selected three mutants from each group and tested plasmid retention rate in selective medium for two to five independent transformants for each of the selected mutants. Our results reveal a correlation between colony size (panels on the left side of Fig. 4; see also the relevant gold bars in Fig. 3a) and plasmid retention rate (right column in Fig. 4). The plasmid retention rates of the 3 tested mutants in group A (largest colonies) are 60-70%, for group B (medium-size colonies) they are 38-65%, and for group C (smallest colonies) they are 17-29%. 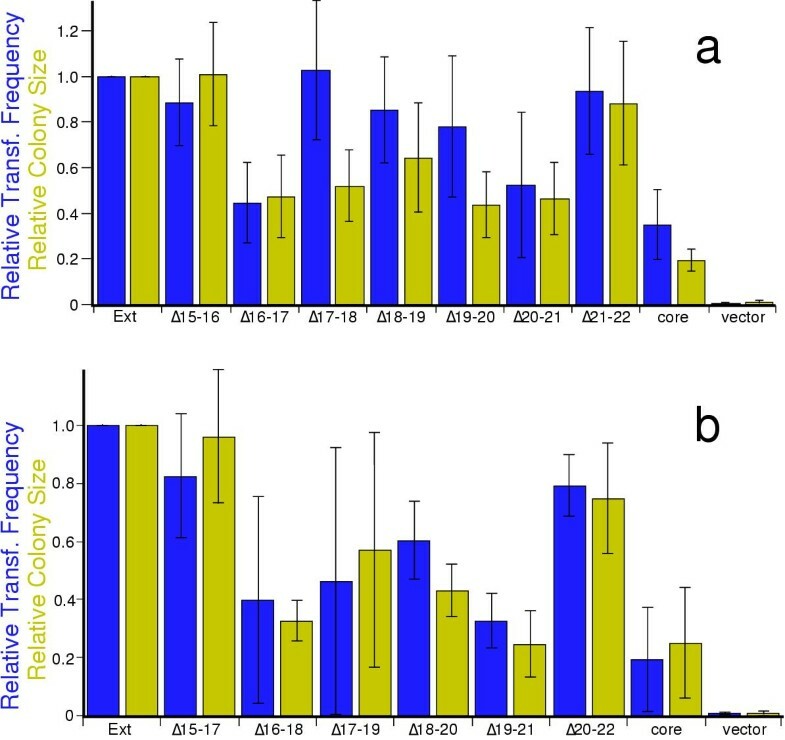 This correlation suggests that colony size measurement provides a valid assay of plasmid origin activity in fission yeast. Note, however, that none of the tested group A mutants had a plasmid retention rate as high as that of extended ars3002 (98%), despite the fact that both their transformation frequencies and their colony sizes were equal to or slightly greater than those of extended ars3002 (Fig. 3a). We do not have an explanation for this discrepancy. It is possible that plasmid retention rate is more sensitive than colony size or transformation frequency to small differences in the plasmid origin activity of highly efficient replication origins. We also do not have an explanation for the fact that the Δ7 mutation led to colony sizes in the medium (group B) range but plasmid retention rates in the higher (group A) range (Fig. 4). In the case of origins of somewhat lower (but still high) replication efficiencies, these and previous results [7, 11] suggest to us that colony size may be a more sensitive indicator of plasmid origin activity than is transformation frequency. These results also suggest that transformation frequency may be a good indicator of plasmid origin activity only when replication efficiency is relatively low. Consider, for example, deletions Δ11-Δ14. In Fig. 3a, where the effects of these deletions were measured in the context of extended ars3002 (with enhancer; efficient replication), these deletions had no effect on transformation frequency but did reduce colony size. Fig. 3b shows that when these same deletions were assayed in the absence of the enhancer (so overall replication efficiency was much lower), each deletion significantly reduced transformation frequency . Qualitative results presented in our previous publication  showed that each deletion also reduced colony size. Thus colony size and transformation frequency measurements seem to vary together when replication efficiency is sufficiently low. Because deletions of stretches of ~50 bp within the enhancer had no effects on transformation frequency and only mild effects on colony size (Fig. 3a), we also tested ~100-bp deletions (double deletions of adjacent ~50-bp stretches, Fig. 5a) and ~150-bp deletions (triple deletions of adjacent ~50-bp stretches; Fig. 5b) in the enhancer region. The data in Figs. 3a and 5 suggest that regions 16-20 all make individual contributions to enhancer activity. Although individual deletion of region 21 does not have a measurable effect (Fig. 3a), loss of region 21 along with region 20 (Fig. 5a) does significantly reduce enhancer activity. Regions 15 and 22 appear to suppress enhancer activity. Although their individual loss does not have much effect-just a slight stimulation of colony size (Δ15) or transformation frequency (Δ22)-their loss is capable of totally suppressing the negative effects of simultaneous deletion of adjacent sequences (Δ16 and Δ17 or Δ20 and Δ21, respectively; Figs. 3a and 5). Region 16 is the ~50-bp region whose deletion most affects enhancer activity (Fig. 3a). However, deletion of region 16 by itself affects only colony size. In contrast, deletions of two ~100-bp stretches (Δ16-17 and Δ20-21) severely reduce both colony size and transformation frequency (Fig. 5a). Two ~150-bp deletions (Δ16-18 and Δ19-21) have even more severe effects, reducing both transformation frequency and colony size to the levels of the enhancerless core, within experimental error (Fig. 5b). The progressively more severe phenotypes of single, double, and triple deletions indicate partial redundancy of function between the three ~50-bp stretches of which each of the two essential ~150-bp regions is composed. This paper describes the first attempt in any organism to determine how the presence of a replication enhancer next to a core replication origin alters the relative importance of the sequences within the core origin. It also describes the first attempt in any yeast to map the nucleotide sequences important for function within a replication enhancer. We have previously shown that ars3002 is the most active of the three replication origins in the ura4 origin cluster on the left end of fission yeast chromosome III (Fig. 1; [7, 8]). We have also shown that core ars3002 is no more active as a plasmid replication origin than is ars3003, whereas extended ars3002 is more active than ars3003 in the chromosome because the core activity is stimulated by the adjacent replication enhancer (Fig. 1), which is also part of ars3004 but which has no plasmid replication origin activity of its own . As a first step toward understanding the mechanism of replication enhancement, we have generated consecutive ~50-bp deletions throughout the ura4 replication enhancer (Fig. 2), and we have tested the effects of these deletions on the activity of ars3002 as a plasmid replication origin (Fig. 3a). We also tested the effects of ~50-bp deletions within core ars3002. The effects of these deletions within core ars3002 had previously been measured for core ars3002 by itself (Fig. 3b; ). Here we determined their effects for extended ars3002 (core ars3002 plus enhancer). 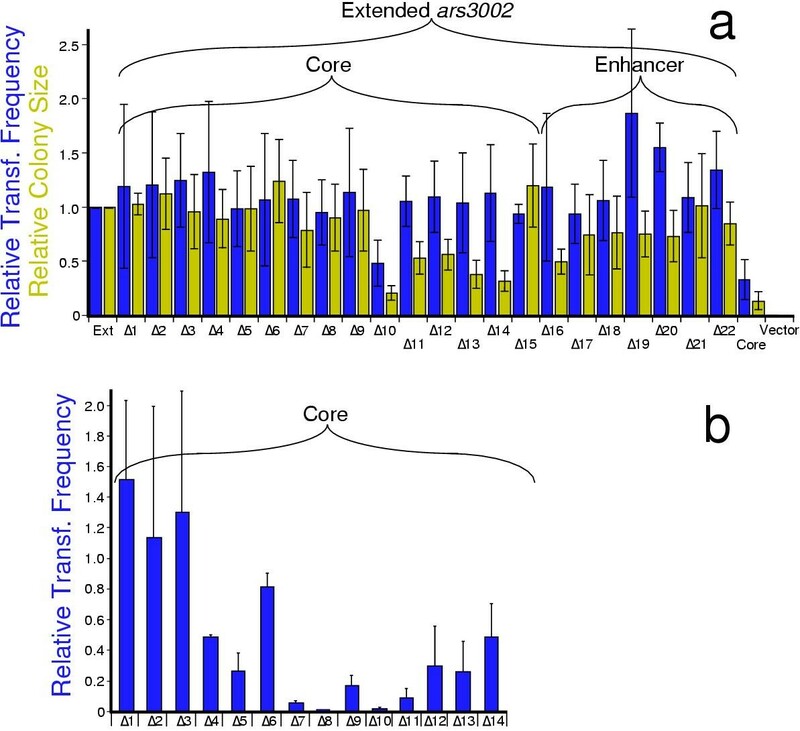 These experiments showed that enhancers deleted for each of the ~50-bp stretches within the enhancer were nevertheless capable of stimulating core ars3002. Thus, none of the ~50-bp stretches within the enhancer is essential for enhancer activity. 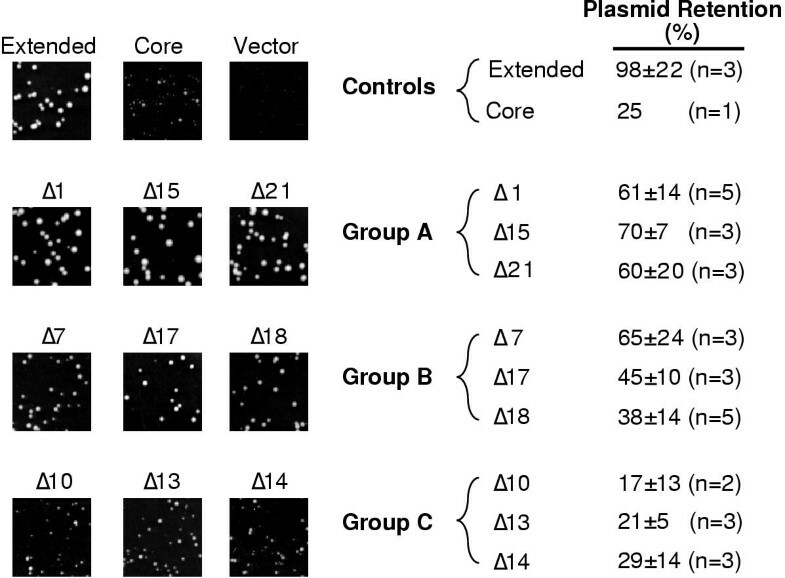 However, deletion Δ16 at the core-proximal end of the enhancer significantly reduced plasmid origin activity as measured by the colony size assay (Fig. 3a). These experiments also demonstrated that many of the ~50-bp stretches that are important for core ars3002 function (Fig. 3b) are not important for extended ars3002 function. The ~50-bp stretch that proved most important for extended ars3002 function is region 10. Its deletion (Δ10 in Fig. 3a) dramatically reduced plasmid origin function by both the transformation frequency and colony size assays. Region 10 contains a stretch of 20 consecutive adenines in the top strand (Fig. 2). Short runs of adenines and thymines are also present in multiple locations elsewhere in ars3002 (Fig. 2). These may be binding sites for the S. pombe Origin Recognition Complex (ORC), whose fourth largest subunit (Orp4) contains a multiple AT-hook domain, which permits it to bind with high affinity to DNA containing runs of adenines or thymines in one strand [14, 15]. In fact, the largest subunit of S. pombe ORC (Orp1) has been mapped by chromatin immunoprecipitation to ars3002 and also to ars2004, which, like ars3002, contains multiple asymmetric A+T-rich stretches [16, 17]. We do not yet know the functions of the other sequences (regions 11-14 and 16-20) that-according to the results in Fig. 3-also contribute (though to a lesser extent than region 10) to the plasmid origin activity of extended ars3002. What is clear, however, is that the functions of all of the ~50-bp stretches are at least partially redundant. None of the deletions, even Δ10, eliminates origin activity. In each case, other sequences within extended ars3002 must be capable of providing at least a portion of the function of the deleted region. The redundant nature of the sequences within S. pombe replication origins has previously been amply noted [10, 11, 16, 18]. However, this is the first time that redundancy has also been found within a yeast replication enhancer. ACE3, the amplification enhancer for the chorion gene cluster on chromosome 3 of Drosophila melanogaster, also contains multiple redundant sequence elements . In an attempt to reduce the redundancy in the enhancer and identify combinations of ~50-bp deletions that, together, would completely eliminate replication enhancer function, we constructed double and triple deletions so that each ~50-bp stretch was deleted in combination with one or two flanking ~50-bp stretches to the left and to the right. These analyses showed that the double deletions Δ16-17 and Δ20-21 were especially effective at reducing origin activity (Fig. 5a), and the triple deletions Δ16-18 and Δ19-21 were even more effective (Fig. 5b). In fact, these two triple deletions reduced the activity of extended ars3002 to the level of core ars3002. In other words, they abolished enhancer activity. The fact that the enhancer contains two non-overlapping essential ~150-bp regions (16-18 and 19-21) indicates that these two regions cooperate with each other to generate enhancer function. Neither provides complete enhancer function by itself. Each is essential for enhancer function. However, none of the three ~50-bp regions that together comprise each essential ~150-bp region is individually essential, suggesting internal redundancy within both of the ~150-bp essential regions. What could be the sequences that contribute to enhancer function within these essential regions? Several laboratories, including ours, have identified consensus sequences that are often found in S. pombe replication origins [9,10,11, 13, 18]. All of these are A+T-rich and are asymmetric in the sense that most of the adenines are in one strand and most of the thymines are in the complementary strand. Previous origin deletion scans (similar to those in Fig. 3) have shown that the regions most important for S. pombe origin function frequently contain clusters of these consensus sequences [10, 11, 16, 18]. To test whether the ars3002 replication enhancer is similarly organized, we scanned it for near matches to the four characterized consensus sequences [9,10,11, 13, 18]. We found several potentially interesting consensus matches within the important portions of the enhancer (Fig. 6). In region 16 (the ~50-bp region that seems most important for enhancer function; Fig. 3a), there is a 10/11 match to the consensus sequence identified by Maundrell et al. , which is highlighted with light green in Fig. 6. Although this consensus, like the three others, has not been found to be completely essential for any tested S. pombe origin, a 10-bp linker substitution in ars3001 (the S. pombe rDNA origin) that removes a Maundrell consensus sequence reduces origin activity about 30-fold . Consequently, there is a good chance that this sequence contributes significantly to whatever role region 16 plays in enhancer function. Nucleotide sequence of deletion regions 15-22 showing near matches to S. pombe replication origin consensus sequences. The sequence shown here is the same as in the bottom portion of Fig. 2. The light green 11-bp sequence is a 10/11 match to the consensus sequence of Maundrell et al. . The blue 30-bp sequence is a 20/30 match to the consensus sequence of Clyne and Kelly . The 14-bp stretch highlighted in light magenta consists of 3 overlapping 11/12 matches to the consensus sequence of Zhu et al. .
Spanning the junction of regions 20 and 21 is a 20/30 match to a 30-bp sequence found by Clyne and Kelley  to be important for ars1 plasmid replication origin activity (blue in Fig. 6). In addition, region 21 contains several overlapping 11/12 matches to the consensus sequence of Zhu et al. [9, 11], highlighted with light magenta in Fig. 6. Overlapping matches to this consensus are also found in region 10 (Fig. 2), which is highly important for ars3002 function (Fig. 3; [9, 11]). These two consensus sequences are therefore good candidates for playing important roles in the enhancer activities mediated by regions 20 and 21. Note that all three of the consensus sequences and also many additional regions within the enhancer contain runs of adenines or thymines and thus are potential binding sites for S. pombe ORC. It has recently been demonstrated that the Drosophila amplification enhancers, ACE3 and AER-d, bind Drosophila ORC . Thus it is possible that ORC binding is an aspect of enhancer function conserved from fission yeast to animals. Testing this hypothesis or any other hypothesis concerning the mechanism of enhancer function will require identifying and characterizing the proteins that bind to the cis-acting sequences described here. During the past decade much progress has been made in identifying proteins that bind to core origins (reviewed in ). This progress provides grounds for optimism that the trans-acting proteins that bind to enhancers will also be identified in the relatively near future. Escherichia coli DH5α cells were used for cloning mutated ars3002 plasmids. The S. pombe strain ura4- D18 (ura4- D18 leu1-32 end1 h-)  was used as the recipient strain for transformation assays. Cells were grown at 30°C in EMM  supplemented with uracil and leucine (150 mg each per liter) when not under selection or leucine (150 mg per liter) when under selection for uracil prototrophy. To construct the plasmid, pUra4script:ars3002(ext), which contains the extended ~1.2 kbp ars3002 , the ~1 kbp Eco RI fragment containing the replication enhancer (Fig. 1) was cut and blunt-ended by treatment with Klenow polymerase (New England Biolabs) and dNTPs. The gel-purified fragment was ligated with Cla I linker and then cut with Cla I and Hin cII to produce the ~400-bp fragment containing the enhancer . The gel-purified ~400-bp fragment was inserted into the Cla I and Hin cII sites of p3002PCR (the plasmid containing core ars3002 generated by PCR; ). The resulting plasmid was then cut with Eco RI, blunt-ended with Klenow polymerase and dNTPs, and self-religated, in order to destroy the Eco RI site at the boundary between core ars3002 and the enhancer that was regenerated during the process of Cla I linker addition. The insert sequences were confirmed by sequence analysis. Deletions Δ1-Δ14 are the same as previously described . To evaluate these deletions in the context of extended ars3002, the ~400-bp Cla I-Hin cII fragment containing the replication enhancer (from pUra4script:ars3002(ext)) was inserted between the Cla I and Hin cII sites of the deletion constructs Δ1-Δ14 previously described . For deletions Δ15-Δ22, the two-step PCR procedure and cloning strategy described previously [10, 11] was employed. All primer sequences are available upon request. Double and triple deletions were constructed according to the same two-step PCR and cloning strategy, except that the choices of internal (forward and reverse) primers for the first amplification step were different. For example, the rightward-pointing (forward) primer used in constructing Δ16 and the leftward-pointing (reverse) primer used in constructing Δ15 were chosen as internal primers at the first step PCR to obtain the double deletion, Δ15-16, and so on. S. pombe D18 cells lacking the ura4 gene were transformed  with equal amounts of DNA (100 ng) from the plasmids under test. All analyses were performed as described previously [7, 10], except that transformation plates were analyzed after 4-5 days, since the growth rates of colonies transformed with enhancer-containing plasmids are faster than those with core ars3002 alone (which was used in the previous experiment ). All results shown are an average of four independent experiments with standard deviation shown as error bars. To determine the percentage of exponentially growing cells containing plasmid, the transformants were grown in selective medium (EMM-uracil) to 1.2-1.5 × 107 cells/ml. Then 500 cells were plated onto selective and non-selective (EMM+uracil) plates to determine the fraction of cells containing plasmid. We are grateful to Deborah Tyrrell for carrying out some of the transformation frequency and colony size assays and for asking important questions. This research was supported by grant GM49294 from the National Institute of General Medical Sciences.